Up until last weekend the best game any team had played all year was San Francisco’s 34-0 win at the Jets. Now that distinction belongs to the Patriots. Their showdown at home against Houston was supposed to be a battle between the elite squads in the AFC, but it turned out to be a stunning mismatch. New England was close to flawless, and they made the Texans look ridiculous. Now they come off that game to face the best team in the NFC in what could easily wind up being a Super Bowl preview. It’s a second very tough game in a row, but it’s also the last big test - only Jacksonville and Miami remain after this one. The Niners were also strong last week, though not nearly as good as the Patriots. The good news for them is that they are not playing the Rams - two of their four non-wins have been to St. Louis. Beyond that they have been very strong in nine of 11 games and brain-dead in the other two. If San Francisco shows up then this could be the best game of the year - something that last weekend’s New England vs. Houston game didn’t deliver on. If they don’t show up, though, then this will be a repeat of last weekend’s Houston debacle, because one thing we can be sure of is that New England will be ready. There is nothing more intriguing in the NFL than when the elite talents of one team run head on into the elite talents of the other. That is certainly the case here. San Francisco is tops in the league in points allowed with just 14.2 per game, and their defense is Top 2 against both the rush and the pass. Led by Aldon Smith and his 19.5 sacks, this defense is ferocious. They run headlong into a New England offense that is tops in points scored with 36.3 per game. They have averaged 42.5 in their last six, and they are also best in the league in total yards. Needless to say, both teams can’t excel at the same time on this front. Your confidence regarding how this is going to turn out will almost certainly determine how you bet on this game - or at least it should. Colin Kaepernick has been one of the big stories of the last month in the NFL - even if, like me, you think that Alex Smith didn’t deserve to hit the bench. 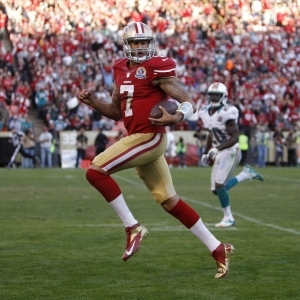 He doesn’t need to be perfect for the 49ers to win this one, but he needs to be solid. The Patriots have not put up great defensive numbers this year, but the last four weeks they have really been able to make things miserable for opposing quarterbacks - including a couple of very good players in Andrew Luck and Matt Schaub. Of particular interest will be New England’s ability to stop the run. San Francisco has the second-best run offense in the league, while the Pats are eighth against the run. If the Niners can run then it will be harder to contain Kaepernick, and, therefore, easier to trust San Francisco. Jim Harbaugh has a massive ego - it’s a big part of what makes him a great coach. He wants to be the best, and to be the best you have to beat the best. Bill Belichick is the best there is, so you can be sure that Harbaugh will be very fired up to come out on top in this one. That alone won’t decide the outcome of the game, but it will certainly make things interesting - especially because Belichick won’t have any interest in losing to a guy who is already compared to him. New England opened as 4.5 point favorites, and that has since climbed to five points, and can be found at 5.5 and even six in some spots. They are by far the more public team in this one, so it is no surprise that about 70 percent of bets have come in on them. The total opened at 46.5 and has been reasonably stable around that level. Short rest shouldn’t be an issue for New England - they are 3-0-1 ATS the last four times they have played on a Sunday following a Monday nighter. San Francisco is 4-1 ATS in their last five on the road against teams with winning home records and 9-4 ATS in their last 13 against teams with winning records. Tough game. On one hand, while I don’t think it will happen, it’s feasible that San Francisco will lose by a significant margin, but I don’t see that happening to New England. I believe in this San Francisco team, though, and I think that their defense is going to have a strong day. Kaepernick and company should be able to move the ball as well. I give San Francisco a good chance of winning, and a good chance of keeping it close even if they lose. I’ll wait as long as I can because the price is only going to get better, then I’ll take the 49ers. I lean to the “under” as well, but it’s too tight to be attractive.